The Accommodation at Hockwold Hall has many of its original features. 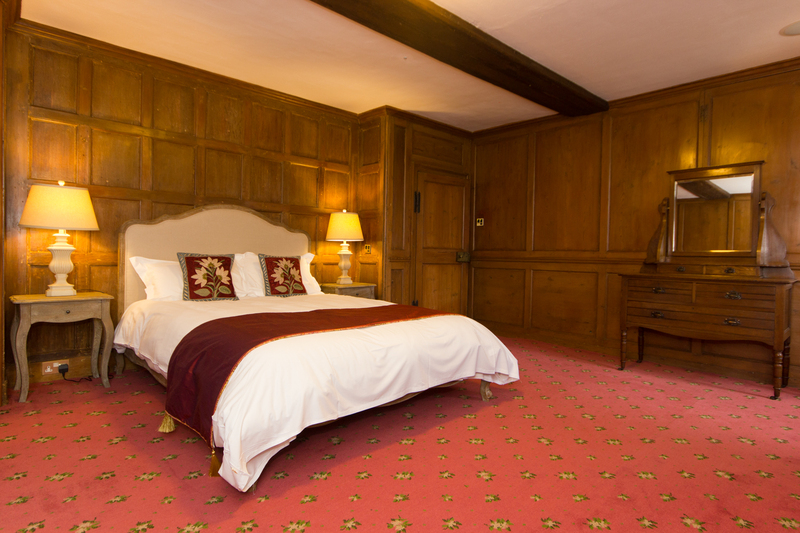 Recently refurbished, each room is elegantly decorated to give a subtle contemporary feel. 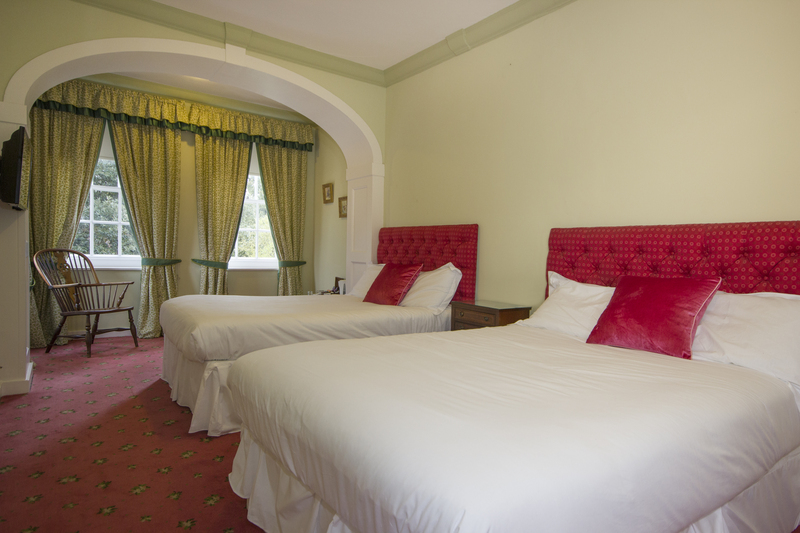 Complimentary tea and coffee making facilities are available in each room with bottled water. CLICK HERE for a list of amenities provided with your booking. * Please note there is no lift or disabled access at this venue. CLICK HERE to take a 3D Virtual tour of the room. 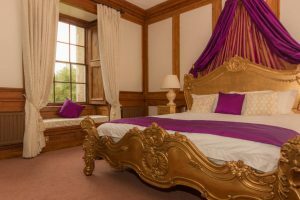 Feel like Royalty for the day; our elegant bridal suite will take your breath away. 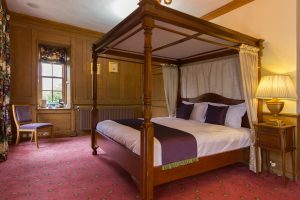 Conveniently secluded, the well-appointed room is bright and welcoming with double aspect windows that directly overlook the lush gardens and grounds. In the corner is a cast iron fireplace with timber mantle and surround. Next door, the large master suite is fitted with a whirlpool bath, corner shower unit with bodyjet system, low level WC and marble vanity unit with his and hers wash basins. 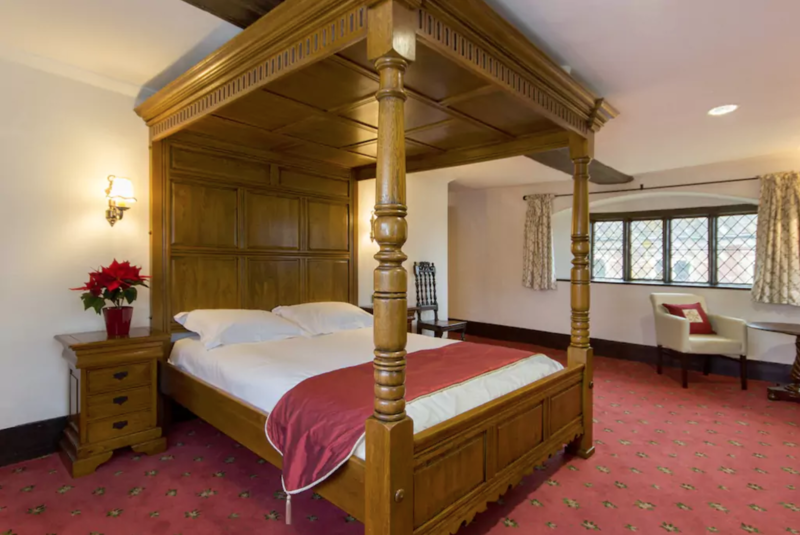 This lovely warm, wood panelled room is ideally situated with windows offering an extensive view of the gardens and grounds. It also features a cast iron fireplace with timber surround and mantle. The ensuite bathroom has a marble vanity unit with inset wash basin, a walk in shower with dual controls, and a low level WC. 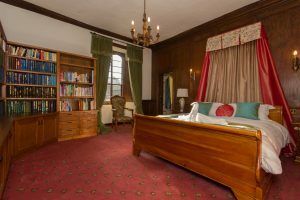 Also coined the “Library Room,” this ornate, wood panelled suite features over a thousand tastefully arranged novels `tthe south facing windows overlook the elegant gardens and grounds. The smaller adjacent Tower Room is a vestibule bedroom, perfect for children’s’ sleeping quarters. The en suite bathroom is fitted with a panelled bath with shower unit over, low level WC and marble vanity unit with wash basin. A luxurious wood panelled bedroom with south facing windows, showcasing the garden. Enjoy a morning coffee or reading a book in the window seats featuring authentic wood shutters. 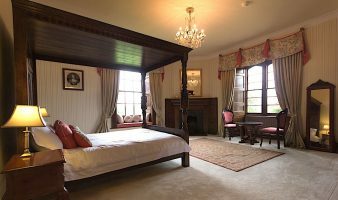 This room has an ornate cast iron fireplace with marble surround and mantle and a door with steps down into the en suite bathroom, with a walk in shower, dual controls, marble vanity unit with his and hers wash basins and a low level WC with a lovely sash window to the south with large fitted cupboards. 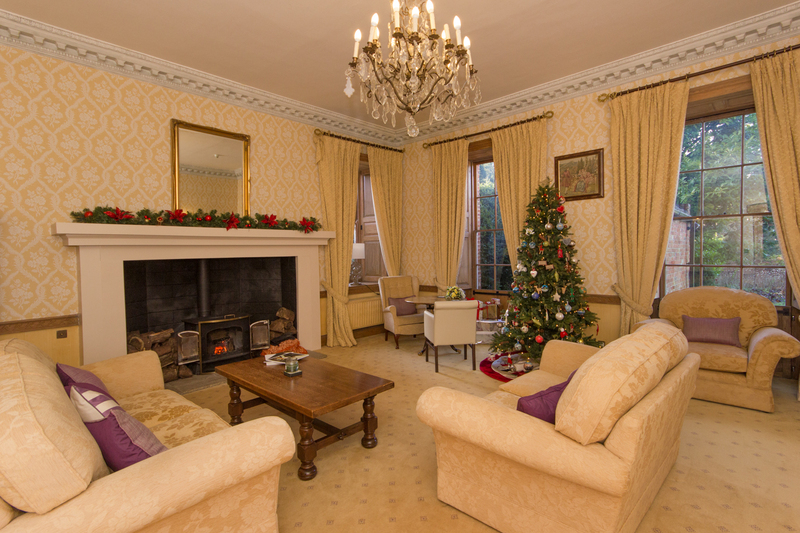 A lovely Family room with two singles and a double bed with sash windows to the south with a lovely garden view. A built in wardrobe and an En Suite Bathroom fitted with a panelled bath with shower over, low level WC and marble vanity unit with inset wash basin. 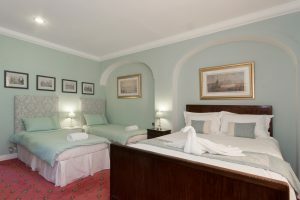 This room has 5 windows with views of the garden and aviary to the South and East of the property. It has a 2 double beds with en-suite facilities. A wood panelled bedroom with windows overlooking the front drive and the gardens. Adorned with a Willam and Mary style fireplace later cast iron inset and timber mantle. The En Suite Bathroom has a dressing area with windows and a three piece suite with a panelled bath, wash basin and low level WC. A double room with windows to the east and south showcasing the elegant garden views. The En Suite Bathroom has a panelled bath with shower over, low level WC and vanity unit with inset wash basin. Marrying old world charm with contemporary elegance, our dining room is inviting yet refined space for any dinner occasion. 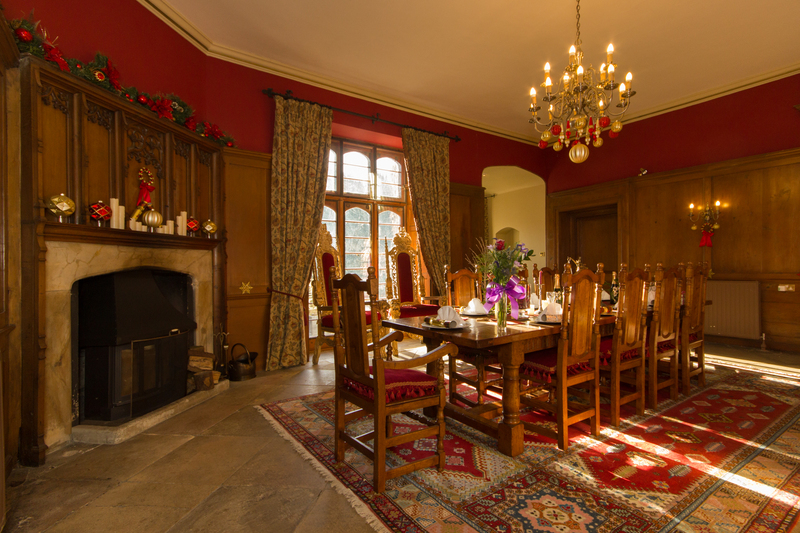 Uniform to many of our other historically retained rooms, the dining area features restored wood-panelled walls, a cherry oak full length dining table and chairs. With a capacity of thirty, the dining area is ideal for small to moderately sized dinner parties. Adjacent to the main house is our Banquet Hall. Mimicking the charm and attention to historical detail, the Banquet Hall is ideal as an extension for larger parties. Because of its distinction from the main house, it also is an optimal venue for small exhibitions or events. And, with a new kitchen extension, it is highly complementary for our catering staff. For pleasant cocktails and canapés our reception hall is a classic setting for your guests. The lounge, now recently updated with a plush carpet, is now coined as “the yellow room” for its tastefully applied yellow shaded hues. 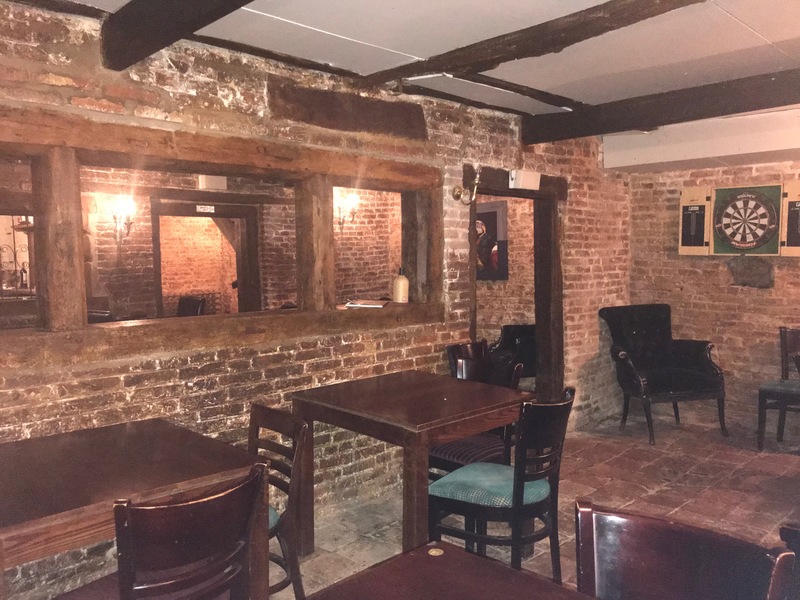 Featuring a 16th century functional fire-place, artistically engraved fireplace mantle subtle touches of the traditional, the lounge exudes hospitality. With it’s 1920s ambiance, featuring soft lantern light, a full bar, and stone infrastructure, enjoying a drink is transformed into a unique and transient experience. The Cellar is adorned with quirky relics and eccentric caricatures, all enhancing your whisky on the rocks. 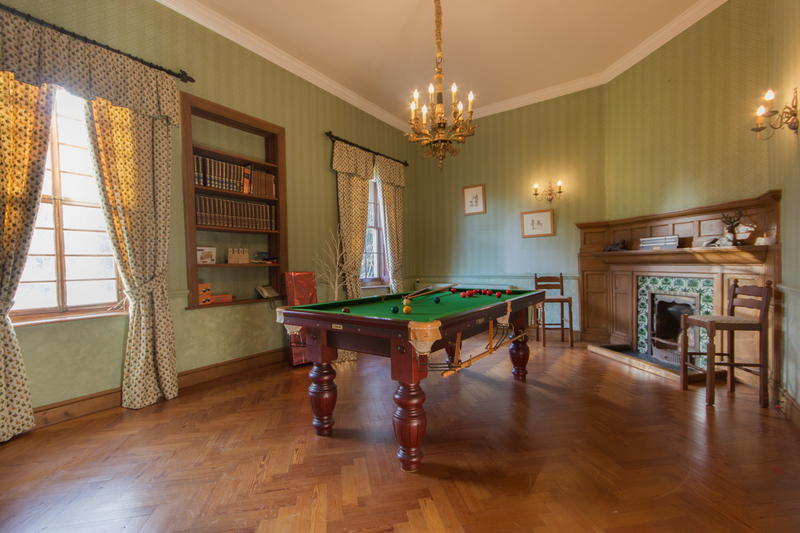 Step inside the 1950s with this traditionally retained “games room” featuring a classic pool table and an infinite supply of films to keep even the unflappable of your guests entertained. 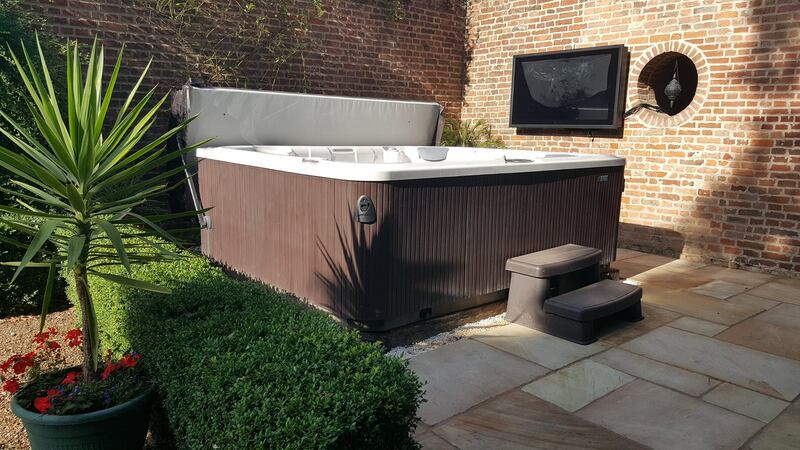 Located in the walled garden, our relaxation area contains a 12 Person Hot Tub, Sauna and BBQ area with seating. 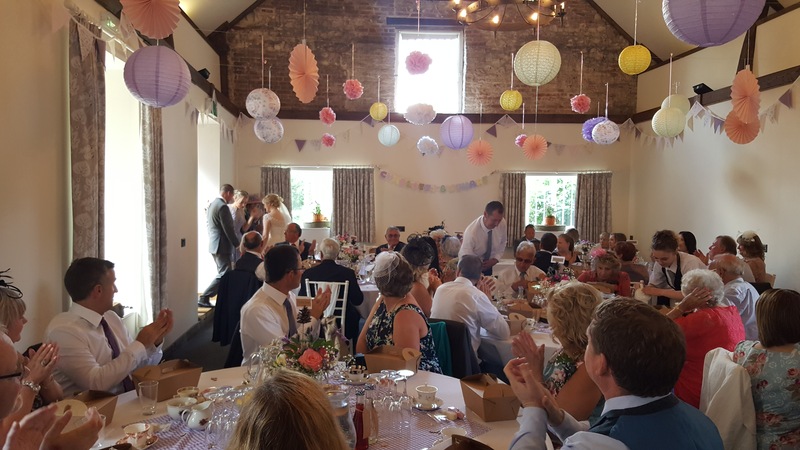 For a space that is both romantic in its hand carved structure and decor but simplistically pleasing in its clean-cut infrastructure and light filled ambience, the civil ceremony room is idyllic. 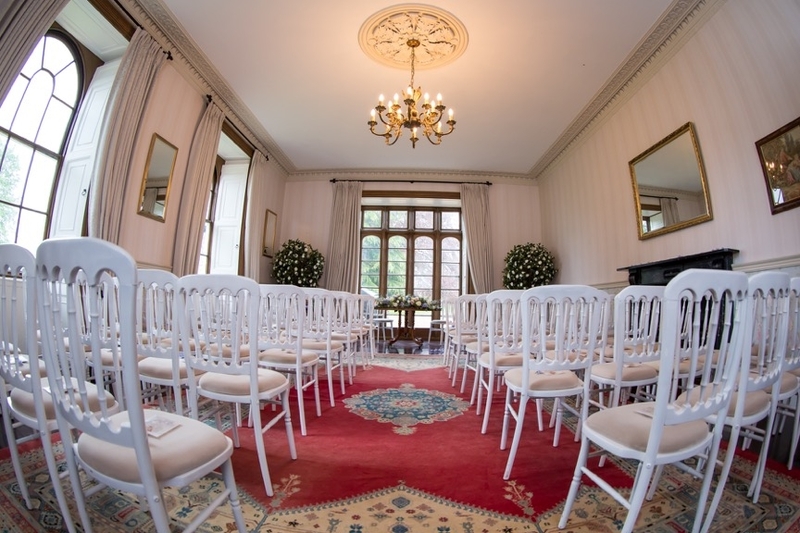 The Ceremony room can be used for civil ceremonies as well as wedding-vowel renewals. The integrity and charm of this room yields endless possibility. 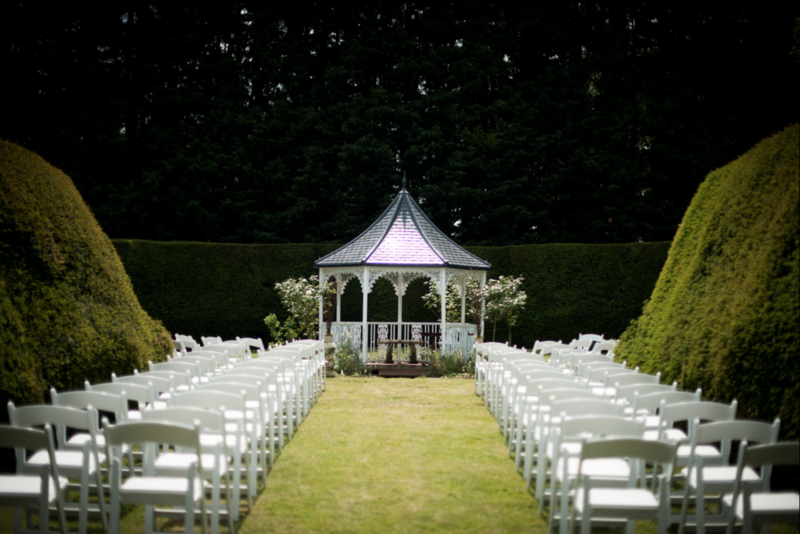 Our Outdoor Civil Ceremony Space is the perfect outdoor location. Our Gazebo structure is licensed by the Norfolk Registrar team. 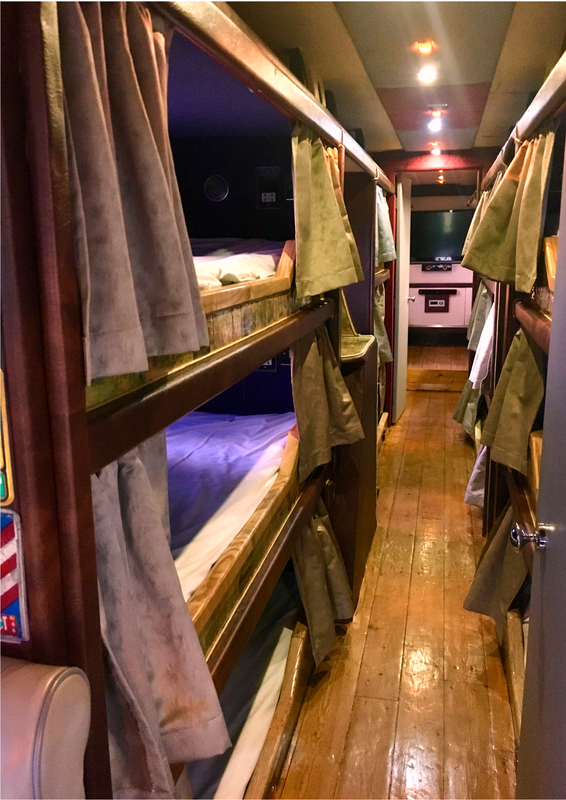 CLICK HERE to Book a bed on the White Tour Bus. 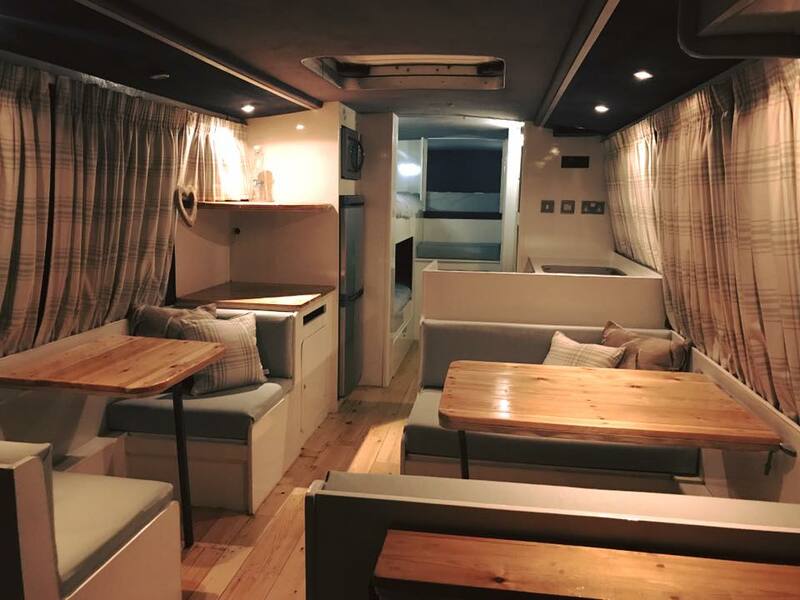 With an elevated demand for travellers of all ages wanting to experience the positive aspects of camping without the “uncomfortable” negatives, Hockwold Hall now offers a unique “glamping” experience with our line of recently renovated tour buses… an accommodation idea which will delight your guests! Hockwold Hall has an incredibly rich and varied history. It is the former Royal residence of Prince Victor Duleep Singh. If you are interested in learning more CLICK HERE for a brief history of Hockwold Hall. Things to do near Brandon: CLICK HERE if you are looking for some activities to do during your stay.